We're getting close. We can feel it. Well, Karyn feels it and I sense that she feels it. It won't be long now until we have 2 new additions to our family. Recently, the twins have changed positions in Mommy's belly. They are a little lower than they have been. She's constantly getting kicked down low. Several times a day, I can hear her cry out from the pressure and the kicks. I feel helpless. As a man, I want to be a problem solver and right now, there's not much I can do. I can just try to make her as comfortable as possible. I try to. I'm happy to take on more responsibility so that she can relax more. I was massaging her legs when they cramped but I read that you're not supposed to do that. Something about possible blood clots, so I stopped. I was dreaming about massaging her legs and would wake up in the middle of the night and find myself doing it in my sleep. She said she didn't notice but I thought that was pretty funny. Karyn isn't sleeping hardly at all. She's uncomfortable all the time but especially at night. When she does get comfortable, she's up all night peeing. She's hoping that Audrey and Bailey hurry up and come. I am as well but we also want them to be good and healthy when they get here. You hear a lot of stories about twins coming early and having to spend extra time in the hospital. We don't want that if we can avoid it. The faster we get them in their pretty nursery after they're born, the better. I asked the doctor if I could cut the umbilical cords but since it's a c-section that she will have, he said no. There's an issue with everything being sterile and they can't risk any unnecessary germs. I'm a pretty clean individual but I guess that doesn't matter. I understand. My friends at work recently threw us a baby shower. It was awesome. I can't even describe how appreciative we are. My work family is a true blessing. Karyn was able to come over to my work so it wasn't just me, a man, sitting there clueless. Everybody talked about how beautiful Karyn is and how great she looks to be carrying 2 babies. She looks better than most women who are only carrying 1. I am biased but she is the most beautiful woman in the world and I'm proud to call her my wife. One of my best friends in the world, Nikki Kim, helped plan the shower and I can't thank her enough. It was a good mix of pink and my favorite color, orange. Nikki's mom actually took some of Nikki's stuff to make these cool lollipops from orange baby washcloths. They were so cool. 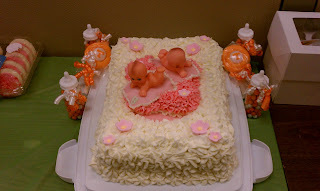 There were plenty of cookies, candy, and a beautiful cake with 2 little plastic babies on top. The dolls were on top of little blankets with "A" and "B" on them. I'll probably include some of the cards and well wishes in this book I'm putting together for my girls. Again, thank you to those who participated. We love you guys. I took the boys to the Maryville Christmas parade over the weekend. We had a blast and the boys got tons of candy that was thrown from floats. We're doing what we can to get in the Christmas spirit. We put up our family Christmas tree and even added a little ornament for Audrey and Bailey. We played Christmas music and sipped egg nog. This has to be the strangest Christmas season I've ever experienced. I don't mean that in a bad way. It's absolutely wonderful. Just different and strange. We're doing most of our Christmas shopping online so we don't have to have Karyn out moving around more than what's necessary. In a way, our situation feels like Christmas. As a child lays awake Christmas eve waiting on Santa to arrive. We too lay awake. We're waiting on our tiny little gifts from God. They will be here before we know it. I only wish someone could tell us how many "sleeps" until we get our gifts. We go back to the baby doctor on December 20. The 34 week checkup. The one the doctor called a "win". We won't get another ultrasound until 36 weeks (if she makes it that long). We hope she carries them as long as she can, comfortably. It won't be long until I have my babies in my arms. I'm so excited! I know Karyn, Jay, and Isaiah are too. Our family is really about to grow. No news on Karyn's thyroid. There won't be until after the twins are here. Please keep our family in your prayers. We thank you.